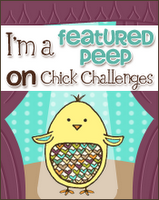 I think I might be stuck in a rut, so I've been looking for some new challenges. Or else wait until school starts and I get my craft room back to myself. In the meantime, I've noticed weird traffic on my blog stats. I think I needed a new challenge just to get some normal people back over here! I recently received an ornament for a favor at a baby shower. What in the world to do with it? Stick it to a card, of course! Having lighting issues here- the ornament is some kind of silver metal. I used it as a stencil to play with m'new Pebbles chalks and then scor-taped it on. The sentiment is Unity. Off for more kids' activities! Very cute! What a great way to repurpose the ornament. I love how you brought the challenge colors into your card, too! 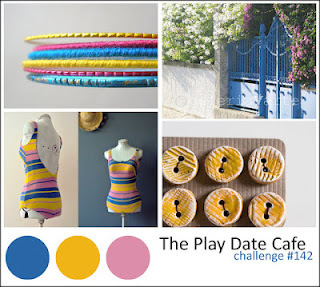 Glad that you joined us for this week's Play Date Cafe Challenge! Great use of the colors...I would love for you to link up at 52 Card Pickup this week! What a sweet card. I can't get over how darling those little feet are! Thank you so much for playing along at The Cafe, come again! 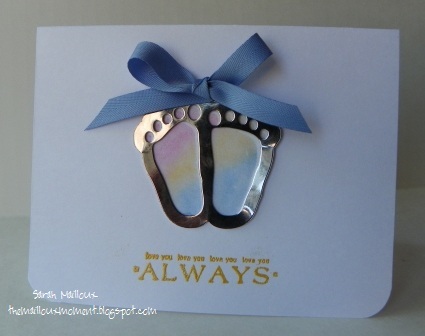 What a sweet baby card. Thanks for playing along with us at The Play Date Cafe!